Historically, La Niña events tend to occur about once every five years, but forecasts over the last few months show an increasing risk of La Niña developing this winter. A really big La Niña like that in 2010/11 is very unlikely, but the chance of a moderate strength event is now several times the historical chance. La Niña is associated with a shift in rainfall towards the western Pacific. Regions from Indonesia, the Philippines, Papua New Guinea, the Solomon Islands and north-east Australia will all be at risk of heavier than average rainfall if La Niña develops. At the other side of the tropical Pacific, Peru would be at risk of drought, but local fisheries would receive a boost as fish stocks can access additional nutrients rising in upwelling currents driven by La Niña. The effects of La Niña aren’t confined to the tropical Pacific. If La Niña develops, then North-western coastal communities of North America would be at increased risk of a cold winter as La Niña increases northerly winds there. Meanwhile southern Africa would be more likely to experience a cooler and wetter summer than normal, and Brazil would have an increased risk of heavy rainfall in coming months. This entry was posted in Met Office News and tagged adam scaife, climate science, El Nino, ENSO, La Niña, Met Office. Bookmark the permalink. 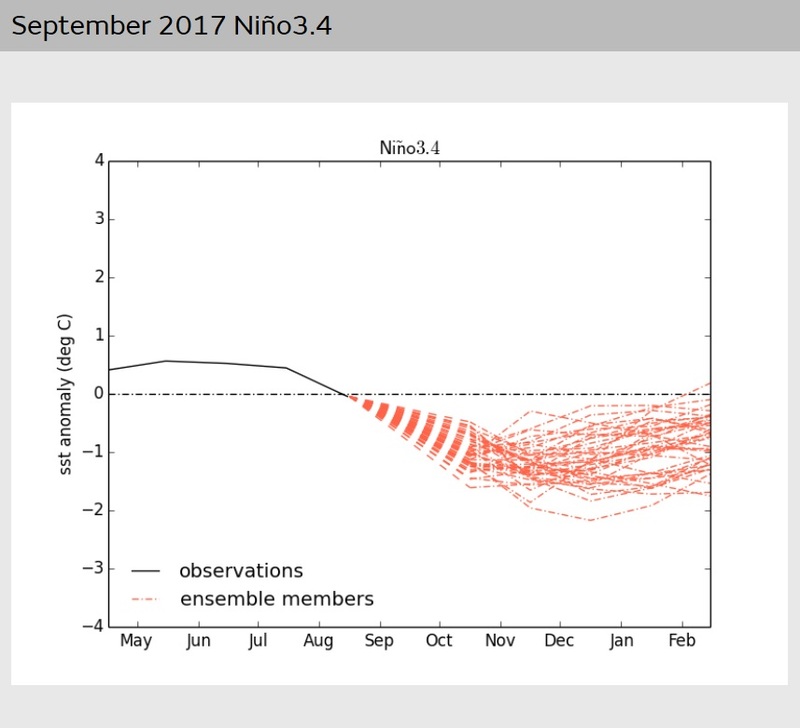 5 Responses to Is La Niña on the way? What can we expect in the UK next year? Random walks trying to predict the joggling of La Nina and El Nino. Whenever the scale goes over zero in either direction one can say well we are closer to a La Nina, for example, but at the same time the odds on it occurring also decrease as it needs to swing back the other way. Once a trend is established the currents of cold and warm water do offer predictability for up to 3 months but no longer.so the message is yes, La Nina should continue developing over the next 3 months but the direction then will be predictable by the new and hence unknown current patterns. As said closer to an event the more likely [less to go] but the less likely due to the known swingback, i.e it really is coin toss betting the known and visible current trend over the unknown and increasing oppositional forces.